Udacity founder Sebastian Thrun touted the company's new program announced in January called Nanodegree Plus, which guarantees that students enrolled in four of Udacity's online programs — Senior Web Developer, Android Developer, iOS Developer and Machine Learning — will find employment in the United States within six months of graduation or receive a full tuition refund. For-profit online educational services provider Udacity held its first-ever user conference last week. The Intersect 2016 Career Summit brought together 75 students and graduates from its Nanodegree programs to Silicon Valley for keynote speeches, workshops, and job-related networking. Conference organizers limited attendance but streamed the event live over the Internet. The attendees were chosen based on their progress in one or more of the dozen Nanodegree programs currently offered by Udacity, and their participation in the Nanodegree community, said Kathleen Mullaney, vice president of Udacity's Careers group, and host of the event. Attendees came from all over the United States, as well as Europe, India, Korea, Brazil, Panama and New Zealand. Udacity founder Sebastian Thrun was on hand to kick off the event. He talked about his decision to abandon his pioneering work on self-driving cars when he was a research professor at Stanford University and, later, a Google vice president and fellow. "All of my colleagues laugh at me and say, 'He had this great thing called self-driving cars. Why did he give it up to become educator?'" Thrun said. "But I think the opposite is true.... Once it's known that you can get a bleeding-edge education from top-notch companies like Google and Facebook for what ends up to be a small price tag.... Stanford right next door charges 60 times as much as we charge.... It's going to force everybody to follow suit." 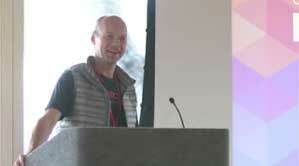 Thrun also talked about a new program announced in January called Nanodegree Plus, which guarantees that students enrolled in four of Udacity's online programs — Senior Web Developer, Android Developer, iOS Developer and Machine Learning — will find employment in the United States within six months of graduation or receive a full tuition refund. The company currently offers a total of 12 credentials through its Nanodegree program. "Based on the data we have so far, we believe that we can pretty much place anybody in the United States who is looking for a job into a job," he said. Thrun focused much of his talk on opportunities in Silicon Valley. "There are so many open jobs here, it's crazy," he said. "We'd love to make this connection, where the value of education isn't just that you enlighten yourself, but it can get you onto a very different career path, where you can actually participate in Silicon Valley." He talked about the potential of the conference attendees to innovate and invited them to use at least part of their time at the conference to explore a mission that they love and to develop a "50-year vision," during which they might solve a problem "that really bugs you." And he talked about the character of the region, which cheers success, but also forgives failure, resulting in a mixture of extreme arrogance and extreme humility. "Silicon Valley is often seen as the story of successes, like the Googles and Facebooks," he said. "What is often less discussed is the many failures. Almost all startup companies die. And this is a good thing, and it's much better that a startup company die fast, than slow. The worst outcome is a company that creeps along for a long time. But this means that we get to experiment here, whether it's on a new education model or a self-driving car." Thrun estimated that 350 Udacity graduates have found jobs since the company began offering Nanodegrees about four years ago. The company claims a current enrollment of 11,000 students and 2,000 graduates to date from 195 countries earning credentials from all 12 programs. Thrun and Udacity co-founders David Stavens and Mike Sokolsky pioneered the commercialization of massive open online courses (MOOCs). Thrun famously abandoned the MOOC in 2013, declaring that his company had "a lousy product," and announcing plans to shift focus from higher ed to corporate training. Udacity has trademarked "Nanodegree," but the concept of an institution-agnostic micro-credential isn't new, and the company isn't the only provider. Coursera, for example, has partnered with Google, Instagram and others to provide a series of "microdegrees." "I actually believe what we are doing here will impact all the universities," he said. "Within 10 years' time, what we are doing here right now is going to be the talk of the town among all the colleges. And the ones that don't adapt will just go away." The event's speaker lineup also included Laura Gomez, founder and CEO at Atipica, Makinde Adeago, founder of /dev/color and Engineering Manager at Pinterest, and Bret Taylor, CEO of Quip.